Brian Tyrell has climbed many ladders in his lifetime. There were those he scaled as a firefighter, saving property and lives while risking his own. A ladder of a different sort took him from on-call firefighting to the top spot at a fire department in one of Macomb County’s fastest growing communities. Pushing him up and over each and every rung were memories of his firefighter father, Bob Tyrell, and what he learned in Macomb’s Fire Science Program. 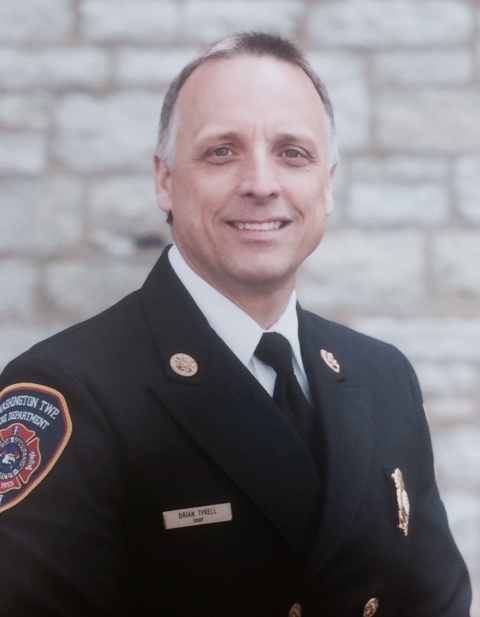 Tyrell earned an associate degree in Fire Science from Macomb in 2007 and has been fire chief since 2014, more than 20 years after joining Washington’s department. He started on-call there as well, went to full-time paramedic firefighter and then served as fire marshal, responsible for developing that department’s first-ever fire prevention bureau. “I had to draw from the knowledge gained at Macomb, specifically, the engineering principles behind fire protection systems,” says Tyrell, “and the science behind fire behavior and fire investigations.” As fire marshal, Tyrell’s job was focused on protecting the community through fire safety education. As chief, he is also responsible for protecting his firefighters who lay their lives on the line. In addition to a commitment to public service rooted deeply in childhood, another thread ties Tyrell’s personal life to his professional one. His oldest son graduated from Macomb’s Fire Science Program and Fire and Paramedic academies and is now employed as a paramedic firefighter, while his youngest is pursuing a career as a firefighter/EMT. And in the department that Tyrell leads, Macomb alumni are the majority. Recruiting and retaining firefighters and mentoring the next officer, fire marshal or chief are what Tyrell considers the most rewarding parts of his job. Among the most challenging are balancing increased demand with decreasing revenues, and anticipating training needs before they arise. “The fire service has always been a very dynamic business to run and today’s fire departments encounter many challenges,” says Tyrell. “Remaining proactive about future firefighting and EMS training needs and technologies is one of the greatest. I thank Macomb for helping train and constantly improve our Macomb County fire service. And “service” is his key message when Tyrell is approached by anyone interested in a career in fire science or firefighting.